Have you seen the lovely combination of blue and black in the interior? Check this out! These days, most homes would either use bold colors or earth colors in order to have that modern feel in it. But there are also homes that have an interesting mix of colors in the interior coupled with patterns and textures to add more depth into it. We have seen many interiors already as well as how colors are used in them. For sure, you already have ideas on what color palette you can use for your home. 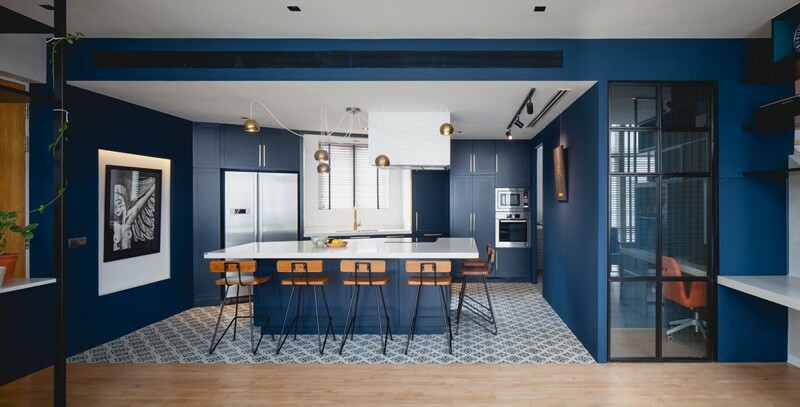 Today, we are going to show you an apartment with blue and black colors in it. 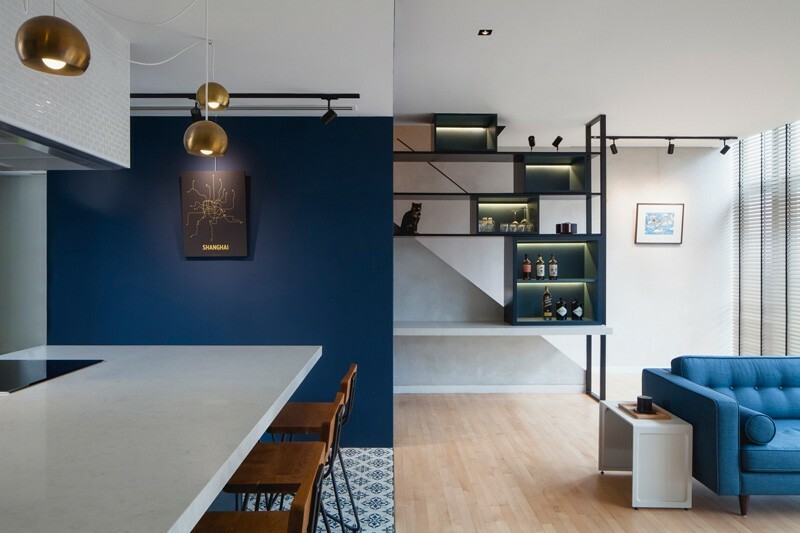 This apartment is designed by Studio Wills + Architects which is a renovation of a 2-floor apartment space in Singapore. On the main floor of the apartment is the living area while the bedroom is located upstairs. 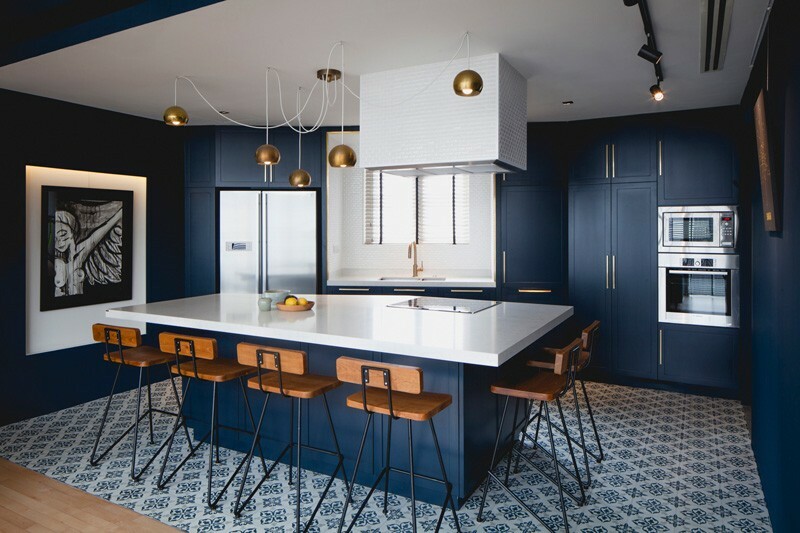 The apartment has a beautiful combination of blue and black as well as some hints of gold, white and even wooden texture. All these combined results into a stunning apartment space that has a subtle masculine appeal. You will surely love the look of the area once you see it through the images below. Unique feature: A beautiful modern apartment with blue and black colors in it as well as some pops of gold. Patterns and textures are also used in here to add appeal to it. You’d seldom see a space with blue and black as color palette but this one looks really nice. Agree? I know you agree because just look at the interior of the apartment. One factor that added to its appeal is the way it is arranged. The interior is lovely not just because of the color scheme but also because of its layout. Proper planning plays a huge role to achieve an impressive look of a home and to make it useful and functional. There isn’t much in the living room. It has a minimal design but because of the sleek furniture in it, it looks very nice. There is also a floating storage space in it as well as a tall cabinet where some plants are added. The apartment has an open layout and just beside the living area is the beautiful kitchen with patterned flooring. 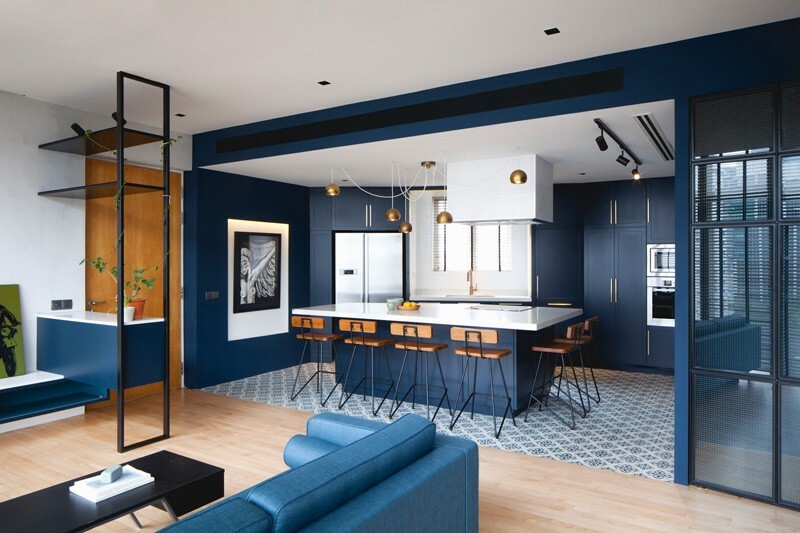 The black and blue colors in the living space is also extended to the kitchen. The kitchen has a palette of saturated blue cabinets, with white countertops. The kitchen cabinets have been painted the same color as the walls, allowing them to seamlessly blend in. The apartment has two ‘boxes’ in the space, the first is the ‘blue box’, seen in the photo below, that hides a study area and powder room. 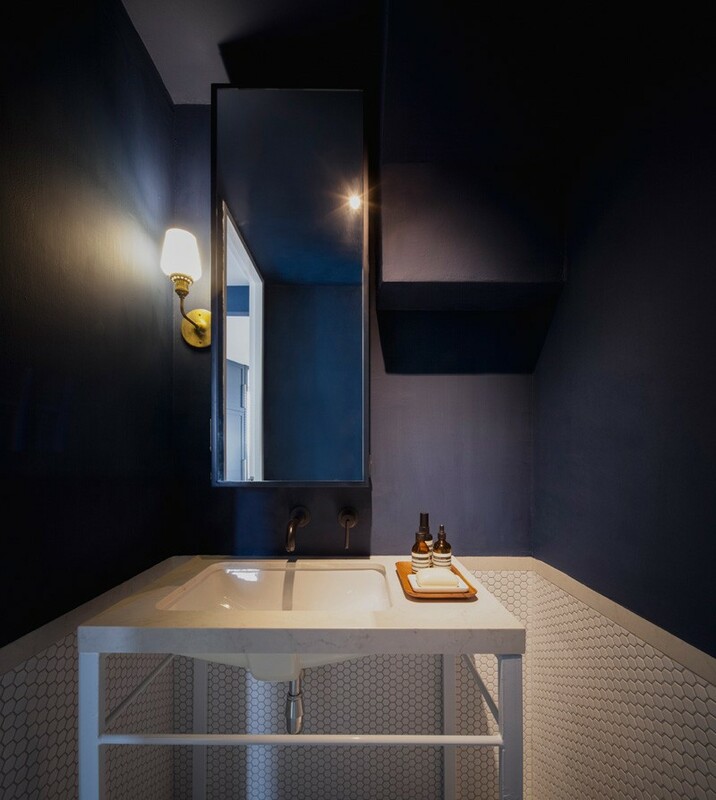 In one of the bathrooms, it used beautiful hexagonal tiles for the walls on the lower part while the upper portion has blue paint. 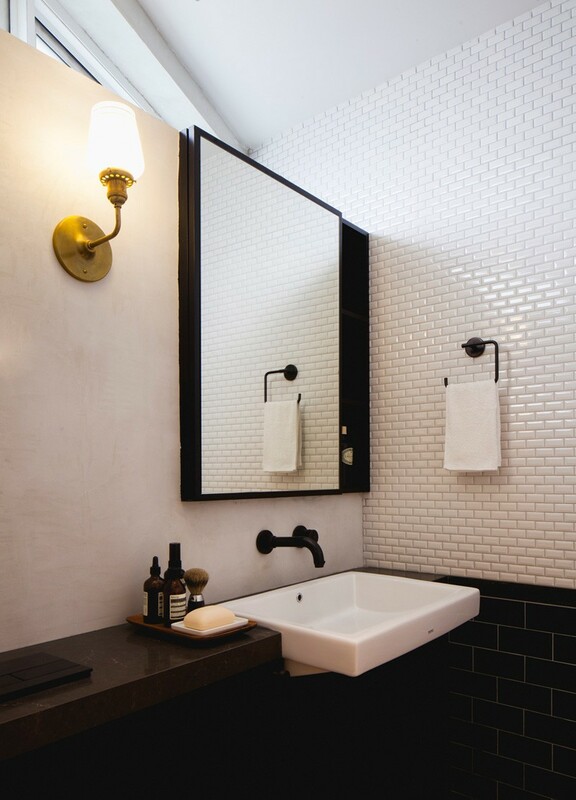 Seen here is a classic looking sink in white. 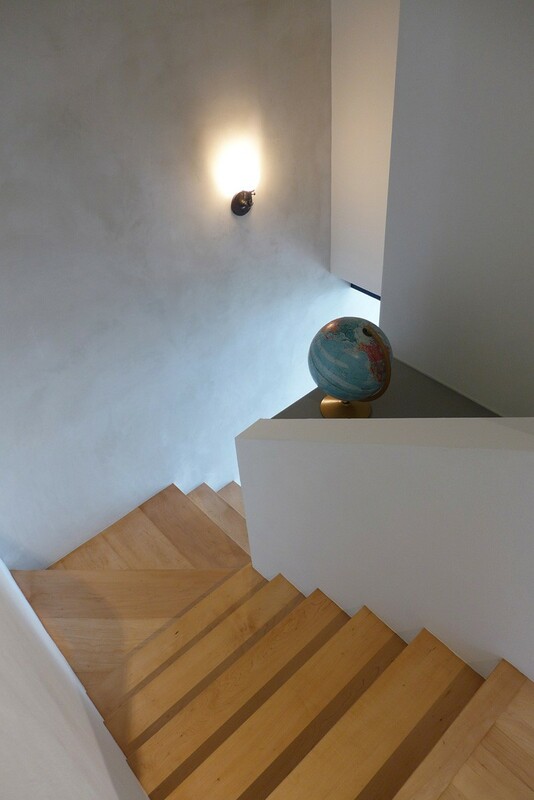 The staircase in the apartment has been left untouched during the renovation. 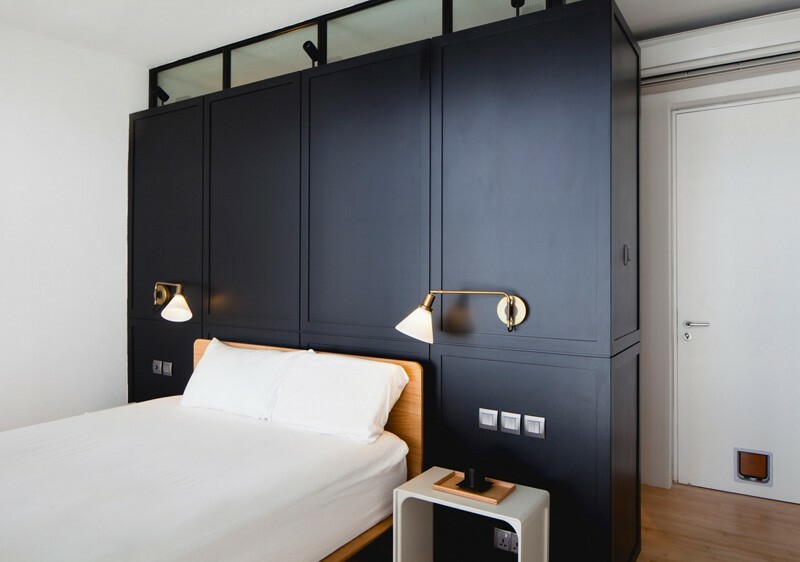 Upstairs, the bedroom has a large headboard, described as the ‘black box’. 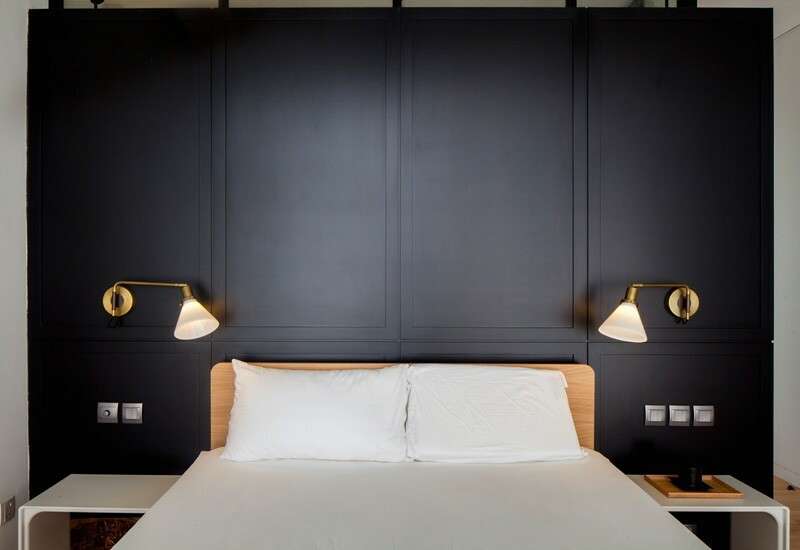 The bed with wooden headboard looks nice against the dark wall in black. It also looks even nicer with the wall lightings in gold finish. Another item that I noticed here are the sleek white side tables on both sides of the bed. 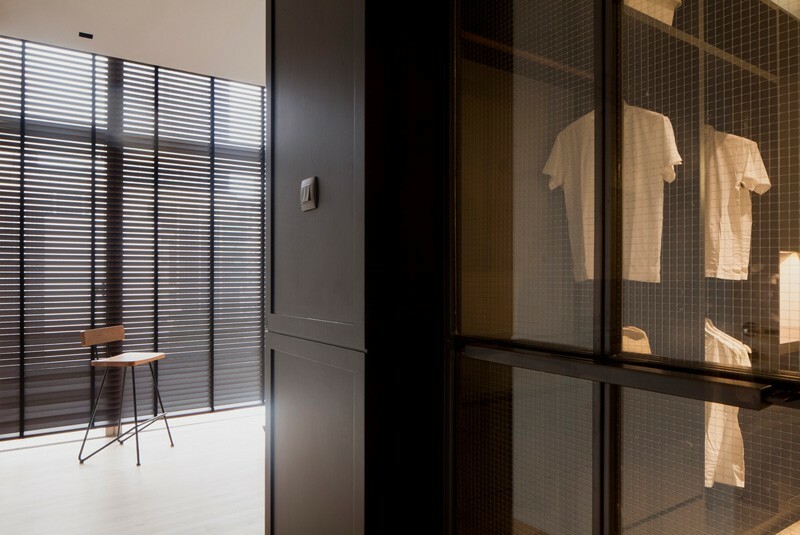 Hidden within the ‘black box’, is a walk-in wardrobe and bathroom. In the wardrobe space, there is a small vanity included inside it which is a good idea so that one can prepare himself not just for the clothes he will wear but even for shaving and others. The toilet and shower are hidden behind a frosted door, accessed through the wardrobe. Tiny white tiles that resembles the look of subway tiles are used on the upper half of the walls while dark blue ones are used on the lower part. 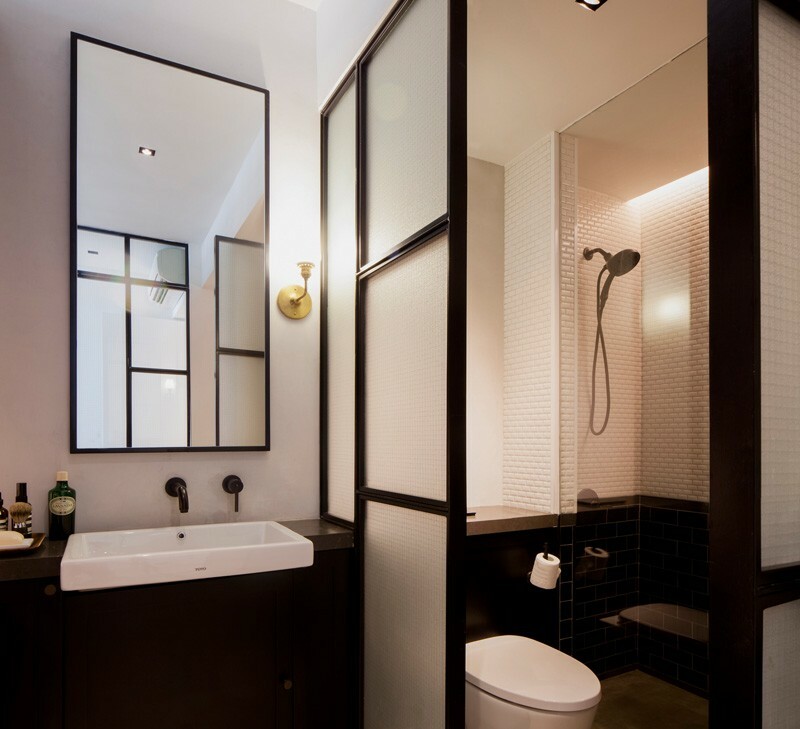 The design of the mirror is obviously customized that fit the slope of the ceiling. Lovely, right? 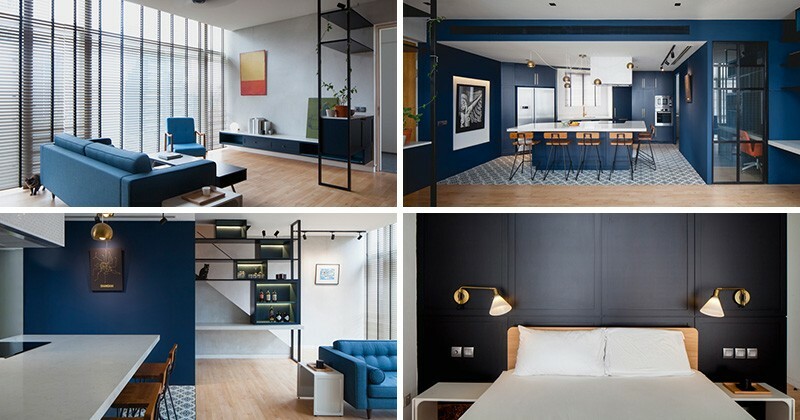 It sure is a stunning apartment with masculine colors from blue to black. And I am sure you also like the way gold was added through lights and other decors. There are also some white colors as well to balance the look. 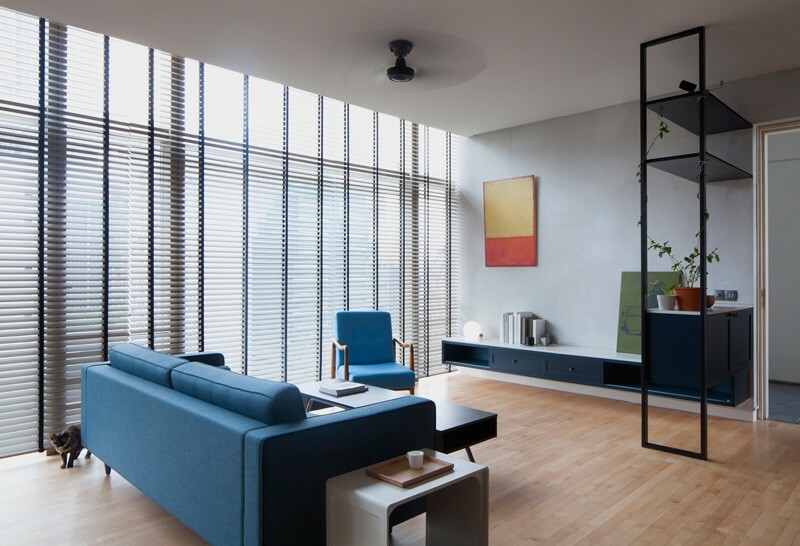 This apartment in Singapore is designed by Studio Wills + Architects who did an amazing job in its design. What I like the most in the home is the kitchen because you would seldom see a blue kitchen as beautiful as the one this apartment has! How about you, what is your favorite feature in the home?